Sounds of Hope is a heartfelt appeal by children FOR sick children. With tam-tams, whistles, drums, and other noisemakers, the children and their classmates walk together with Sounds of Hope: an act of philanthropic education – a responsible uprising. To find out how you can create your own Sounds of Hope, contact Alessia! Share your Sounds of Hope! Elementary and high school students – young philanthropists and ambassadors of the Children’s. Sounds of Hope is a heartfelt appeal by children FOR sick children. With tam-tams, whistles, drums, and other noisemakers, the children walk together with Sounds of Hope : an act of philanthropic education – a responsible uprising. Each school initiates their own Sounds of Hope throughout the year. 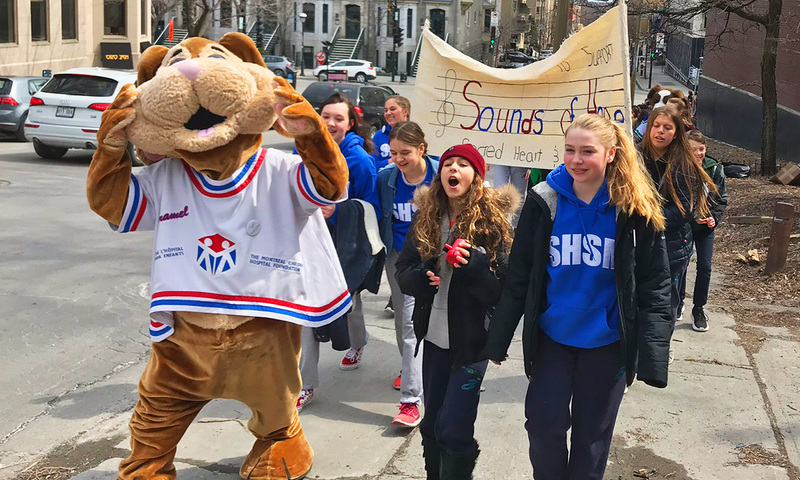 In each school’s neighbourhood - student want their Sounds of Hope to be heard loud and clear! Teach and nurture a sense of philanthropy to the youngest, the leaders of tomorrow, by helping sick children receive the most advanced medical care through fundraising for the Montreal Children’s Hospital.